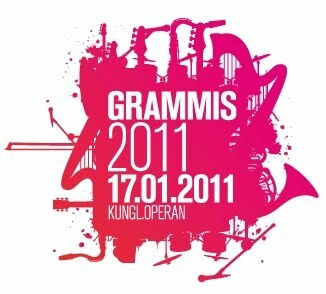 It's just a week before the biggest Swedish awards Grammis will praise the most successful artists of 2010 giving them victory in every of 21 nominations. On January 17th we'll know these winners but now we can take a look at who was noticed by Grammis this time. Robyn gets the biggest bunch of nominees this year - Best album (Body Talk), Best artist, Best song (Dancing On my Own), Best composer (with Klas Åhlund), Best female artist, Best international success and Best innovator. Ex-Snook colleagues are everywhere again - Oskar Linnros is nominated in categories Best artist, album, song, composer, male artist, newcomer, lyrics and Daniel Adams-Ray gets nominees Best song and male artist. I should also mention Håkan Hellström (Best album, artist, composer, male artist, producer, lyrics), Säkert! (Best album, female artist, lyrics, composer), Johnossi (Best artist, song, group, innovator). Among others candidates we can see also Anna Von Hausswolff, Petter, Salem Al Fakir, Pernilla Andersson and First Aid Kit. In category Best international success expected Max Martin, Red One, Robyn and Swedish House Mafia will compete with absolutely unexpected rock-band Dungen being successful in US last year though. Category Best song has become quite interesting this year - all three first places of Melodifestivalen, both Snooks, Idol-winner, RedOne protégé Mohombi, Robyn, Swedish House Mafia and Johnossi. Too tough! But you can say your word in this competition voting here for your favorite song. Chek whole nominees and Robyn at Grammis-2009 list below.